Seminole State womens golf Coach Christa Teno. 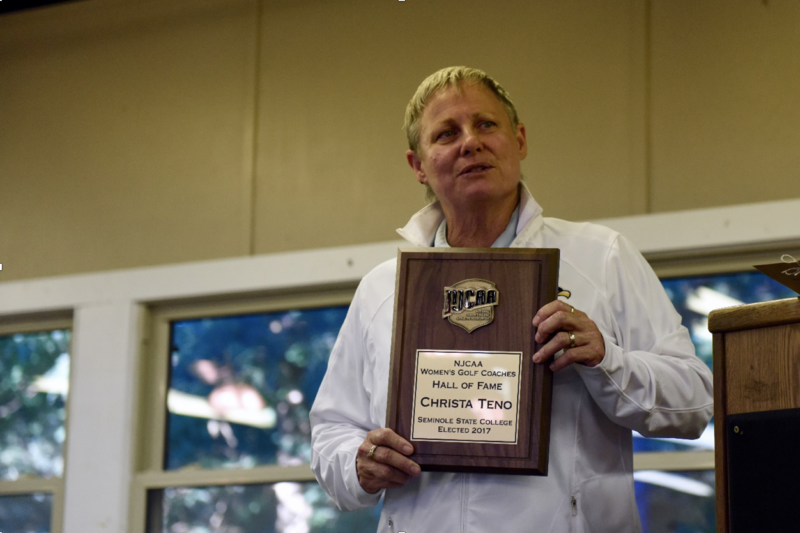 Christa Teno is currently the head coach for the Seminole State Womens Golf Team, but growing up, she loved all sports. Still, golf was her aspirations. She said golf was everything for her. Teno enjoyed the practicing, the hard work and determination it took. She enjoyed figuring things out along with the game, and what it took to be the best at it. She began playing golf at the age of 8 years old and it became “more than just a game,” she said. It was something that distinguished her as Teno grew up with eight siblings. She improved steadily and soon went on to play in local golf tournaments. She would go on to receive a college scholarship for golf and played for the University of North Texas. While there, she won the North Texas State Female Athlete of the Year (1985). As her years from playing started to wind down, she began to coach. “I went from playing, to teaching, to coaching in a matter of time,” she said. She began coaching in March of the 2006-07 season at Seminole State. A lot has happened to Christa in the game of golf itself in her lifetime. She has been coaching at Seminole State College for more than 10 years now. She was a former LPGA Tour player and was named Southeast Section Coach of the Year by LPGA Membership in 2008, 2012, and 2015. She has led Seminole State Women’s golf team to a National Championship in 2015, 3 runner-up finishes, and 2 third place finishes at the NJCAA National Event. Teno’s hometown is Tecumseh, Ontario, Canada. In 2010, she was inducted into the Windsor/Essex County Hall of Fame. In 1998, she was the LPGA Teaching and Club Professional National Stroke Play Champion. In 2017, she was inducted in the NJCAA Women’s Golf Hall of Fame. She has a bachelor’s degree in interpersonal and public communication from North Texas State University (now University of North Texas).